One of the most loved vegetables and for good reason. Enjoy fresh from the garden in the summer. Peel, seed, and cook for sauces and soups. 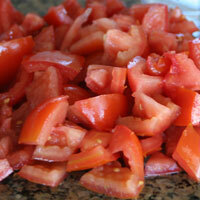 Top bruchettas, make fresh salsas, use in salads, layer in sandwiches, etc. One of the most nutritious vegetables as well. It makes the lists of superfoods and is recommended by nutrition experts to eat every day. 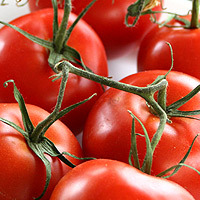 I have heard many times, "Tomatoes aren't a vegetable, they are a fruit." This is true by definition, but 'vegetable' is a culinary term and tomatoes fit in this category. Vegetables consist of leaves, roots, pods, and seeded produce (fruit) among other things. Boil a pot of water. 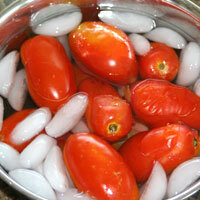 Rinse tomatoes and add to the water. 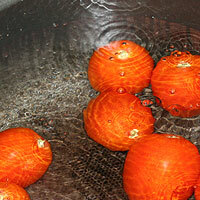 As soon as you see a break in the peel, remove from the hot water. Place in an ice bath to stop them from cooking. Using a knife, cut the top out. Slip the peels off and discard. Cut in half and gently squeeze out the seeds. This step is optional, but I like to do it. The seeds are bitter so I like to discard them. 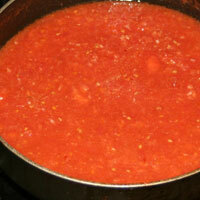 Also, the liquid surrounding the seeds adds a lot of liquid to a sauce, which waters it down. 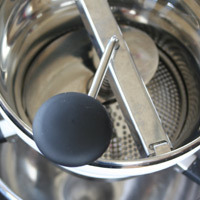 For the best consistency and taste, process using a food mill or a potato masher. A blender or food processor is quicker and easier, but the taste and consistency won't be as good. 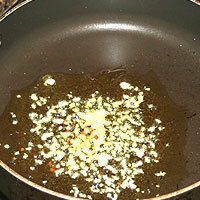 Heat oil and seasonings before adding the tomatoes. This brings out their flavor which will then infuse the sauce. Add tomato sauce and stir well. 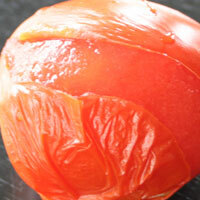 To keep the fresh tomato taste, heat up to 15 minutes. 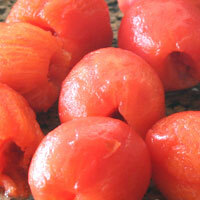 For a stewed tomato taste, cook 15 minutes to 3 hours. 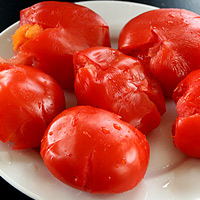 Rinse tomatoes well. Cut the top out. 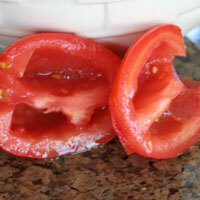 Cut each tomato in half. Gently squeeze out the seeds Chop to desired size. 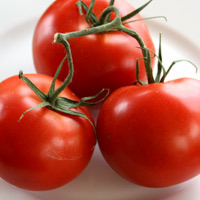 Rinse tomatoes well. Cut the top out of each. 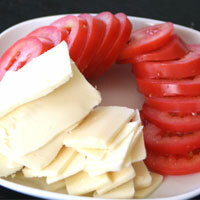 Slice in wedges for salads. 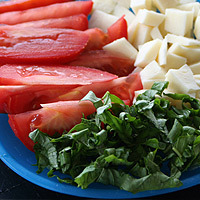 Slice in rounds for sandwiches and some bruschettas.